Being a lecturer at one of the most prestigious universities in Whitechapel, London, I often shop at Aldi. Imagine my surprise, then, to glance across the aisle and spy Peter Sands doing his shopping. Having read so much recently about his enlightened approach to partnering with the private sector, I couldn’t miss the opportunity for a quick chat. Me: Hello Peter, woah, careful with that aluminium telescopic ladder! Peter: Oh, yes, sorry. I can’t resist Aldi’s SpecialBuys. And this ladder is a bargain! Me: Isn’t it just. But i’m surprised to see you in Aldi, Peter. Me: And so accessible – one need only reach out and, there, you see, there’s a six pack in my basket. Damn, if we could just do that with bed nets. Peter: That’s given me an idea. Peter: Maybe. I’ve just launched this new global health partnership. Me: You’re new, it’s not. Peter: Look, who’s the Executive Director of this goddam Fund, you or me? Me: Anyone worth their weight in low sodium flavouring will tell you that alcohol and AIDS, TB or Malaria just don’t mix. Peter: You’re missing the poi…holy molasses, have you seen this – 4 cans of Rheinbacher German Pilsner for just £2.99! Peter: I made it perfectly clear in no media interviews whatsoever that: “My intent is to increase (not dismiss) the diversity of those engaged in global health, in part by drawing in the private sector more effectively”. Me: Yes, but we’re talking about the alcohol industry, Peter. The al-co-hol industry. Me: You’re new to this game, aren’t you. Peter: Hang on. SpecialBuy alert! Heckler and Koch oven gloves. I’ve got to have me a pair of those. Me: You’re not listening. Here’s what someone on Twitter had to say about your latest partnering wheeze: “Similar to #Tobacco, the Alcohol Industry is not the type of private sector diversity needed in #GlobalHealth. The SDGs envision alcohol regulation, not partnership. Partnering with Big Alcohol is absurd, and painfully, even deathly, inconsistent and incompatible with the SDGs”. Peter: Look, I see where you’re going with this. You don’t think that my Global Fund for Alcohol..
Peter: TB and Malaria should be partnering with Heineken because they ‘happen’ to sell a product that ‘happens’ to be associated with poor adherence to combination anti-retroviral therapies. Me: Amongst other things. But more than that, the alcohol industry is using you to ‘healthwash’ its products. The public health community is aghast at what you are doing. Recent correspondence in the Lancet put it this way: “It is clearly an attempt by the alcohol industry to market partnerships with key global health actors to reframe themselves as part of the solution instead of the problem”. Peter: Sorry, I zoned out for a second. 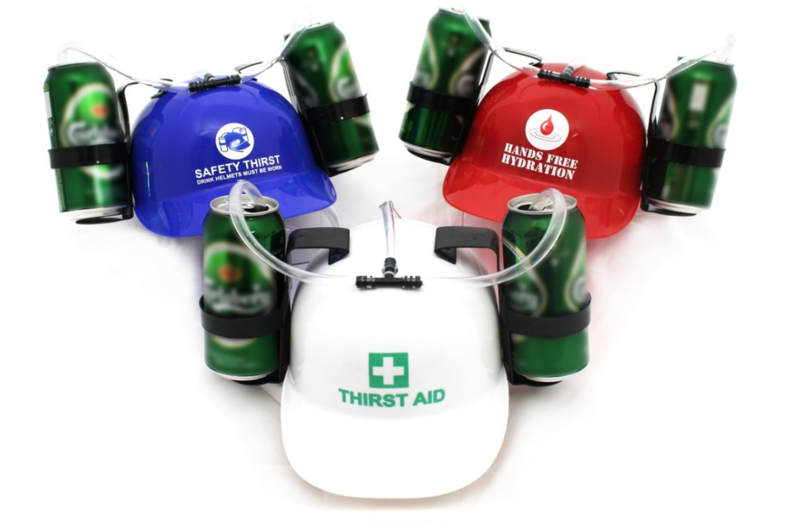 Have you seen this hat – look, it’s got holders and a straw – hands-free drinking. I can’t wait to wear it to the next Board meeting. Me: Good luck with that, Peter.